The NYT Sunday Book Review Weighs In! 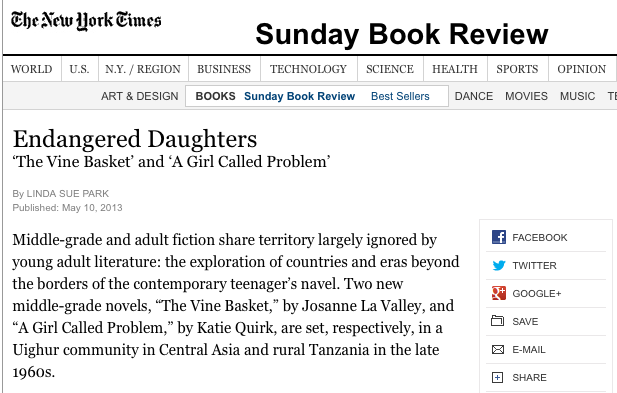 Linda Sue Park reviews A Girl Called Problem and The Vine Basket by Josanne La Valley in the New York Times Sunday Book Review. I’m delighted to see A Girl Called Problem featured as part of this conversation. This entry was posted in A Girl Called Problem and tagged A Girl Called Problem, Endangered Daughters, Linda Sue Park, New York Times, NYT, Sunday Book Review, The Vine Basket. Bookmark the permalink.